Saint Symeon the Devout (also known in English as Symeon the Pious or Symeon the Studite) was a 10th century monastic of the Monastery of Stoudios in Constantinople. Little is known about Symeon's life, and what we know comes primarily from the writings of his spiritual child, Saint Symeon the New Theologian. He was born around 918 CE, became a monk at the Monastery of Stoudios in 942, and reposed in around 986 or 987. When Saint Symeon the New Theologian was fourteen, he met the renowned Elder Symeon the Devout at the Monastery of Stoudios, who would be a major influence in his spiritual development. He remained in the world for several years preparing himself for the monastic life under the Elder's guidance, and finally entered the Monastery at the age of twenty-seven. Symeon the Devout recommended to the young man the writings of Saint Mark the Ascetic (March 5) and other spiritual writers. At night, young Symeon's prayers grew longer and he remained praying until midnight. Once, as he was praying in this way, a most brilliant divine radiance descended upon him and filled the room. He saw nothing but light all around him, and he was not even aware of the ground beneath his feet. It seemed to him that he himself became light. Then his mind rose upward to the heavens, and he saw a second light brighter than the light which surrounded him. And on the edge of this second light, he seemed to see Saint Symeon the Devout, who had given him Saint Mark the Ascetic to read. Forty chapters in the book Patmiacus 427, all pertaining to the spiritual life, are credited to him as "Symeon the Devout" (Eulabes in Greek). His own writings show him as taking a practical approach to the spiritual life, while other writings from that time described him as a Holy Fool. 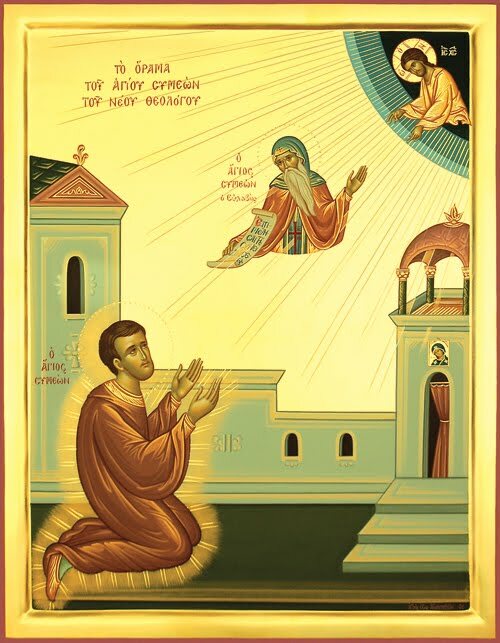 Symeon the New Theologian revered him as a saint, which drew the rebuke of ecclesiastical officials who felt the younger Symeon was honoring someone who they considered to be less than saintly. Younger Symeon wrote a service in honor of Elder Symeon, but it no longer survives. 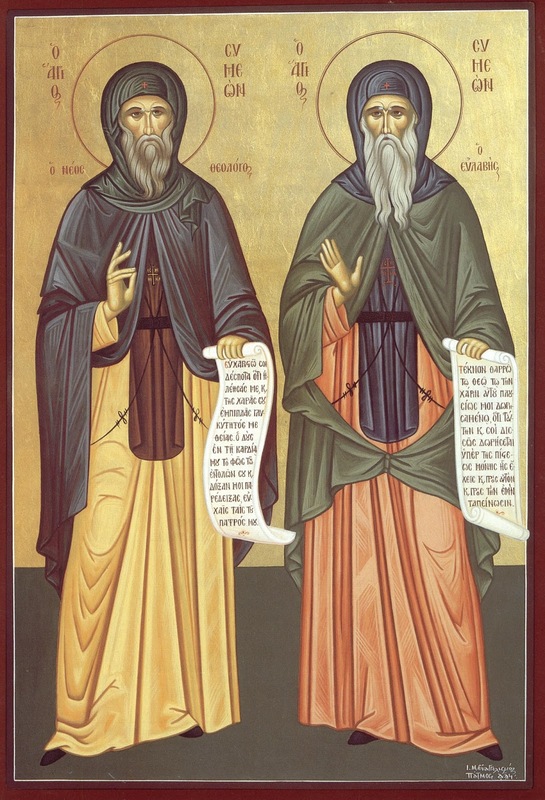 Both are commemorated by the Holy Church on March 12th, but Saint Symeon the New Theologian's feast has been transferred to October 12th, because March 12th usually falls during Great Lent, not allowing for a proper celebration.